Eva Stachniak’s The Winter Palace is a colourful tale of the first years spent by Princess Sophie – who in the course of the novel becomes Catherine the Great – in St. Petersburg’s infamous Winter Palace. 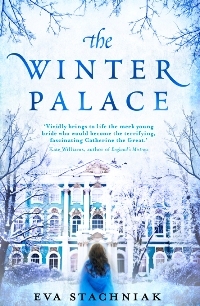 Told from the point of view of Vavara, a Polish girl who finds herself at the heart of Empress Elizabeth’s court, The Winter Palace is a veritable assault on the senses as well as a thoroughly absorbing tale. Left an orphan Vavara, the daughter of an impoverished bookbinder who enjoyed the patronage of the royal court is permitted to serve in the court of Russia’s Empress Elizabeth. She begins her life in the palace sewing room but Vavara is a hopeless seamstress and she has to endure the wrath of the critical wardrobe mistress. In the hours of darkness Vavara wanders the labyrinthine corridors of the Winter Palace where she discovers how easy it is for an unimportant young girl to go unnoticed, and just how many secrets are kept within the palace walls. But Vavara learns that even those who spy risk being spied upon. One of the Empress’s trusted advisors spots Vavara’s potential and trains the young woman in the art of espionage: how to eavesdrop, where to find those secret places people might hide letters, the best way to hide oneself to watch the comings and goings of the palace undetected. Vavara will report what she learns to her spymaster. She quickly becomes a favourite of the Empress thanks to her guile and when Elizabeth decides it is time for her nephew, Peter, to marry, she decides that Vavara should be assigned to serve Princess Sophie the Prussian Princess whom the Empress has picked out as a bride. Vavara sees in this role an opportunity to secure her future. The apparently naive, young princess is destined to become Catherine the Great, the most powerful woman in Russia, and by making herself indispensable, Vavara believes she can ensure she rises with her. Two factors threaten to thwart Vavara’s plan: the Princess proves to have more steel than anyone at first thought, and Vavara starts to become fond of the Princess and feels she needs to protect her from those who would wish to have her discredited. At the heart of the story is Empress Elizabeth’s need to have an heir and as she herself is unmarried and childless, she is relying on the Grand Duke Peter and Grand Duchess Catherine to produce a child. However, when the couple fails to conceive, the Machiavellian workings of the royal court come into their own. The Winter Palace is a story as lavish and decadent as its setting. The writing is intensely descriptive, sometimes going into overload, but the superb story is strong enough to carry it. Stachniak has obviously done copious research and there is much to learn from this novel but it never becomes scholarly. In fact the story might be described as the stuff of the historical tabloids with tales of carousing guardsmen, scheming servants and the nocturnal comings and goings in the royal bedchamber. If it wasn’t for the fact that this tale is based on reality one might argue that it pushes the bounds of credibility and if not for the all too frequent slow sections, this could rival any Tudor era romp. Allowing the reader to see the Winter Palace through Vavara’s eyes is a splendid idea as it gives an insight into life both above and below stairs. We learn a lot about the intricate hierarchy of Russian society and how one might climb – but only so far – up the ranks of commoner or noble but not from commoner to noble. As descriptive as the writing is, the plot is event driven but Stachniak takes her time in telling the story. She writes frequently of Peter’s erratic behaviour, or the lovers sneaking into the Empress’s bedroom, adding extra pages without giving anything more to the plot. For me the highlight of The Winter Palace is the cast of colourful characters; some we know already from history but the supporting characters are – with the exception of Vavara ironically – first rate. Egor, the officer that the Empress marries Vavara off to, is larger than life, a conceited carouser who reminded me greatly of Jane Austen’s Mr. Wickham while the Crown Prince Peter is almost grotesque in his awfulness. The reality of the union between Sophie and Peter is that they were by today’s standards still young when betrothed and although both understood their position and what was expected of them, it’s difficult, as a contemporary reader, not to see two children playing at being grown up. There is perhaps something of the pantomime villain about these characters which may explain why Vavara is in comparison rather two dimensional; although she makes a reliable narrator there’s little to like (or not) about her as a protagonist. The second half of the novel does get bogged down a little in the machinations and intrigues of international politics which add nothing to the main plot and a major disappointment of the novel is that we learn little about Catherine herself outside what Vavara relates. The climax is, though, well worth the wait. This well researched and beautifully descriptive novel is a must for fans of historical literature and the subject matter makes for an interesting and welcome diversion from the myriad works of fiction set against the backdrop of the Tudor era. The subject allows for much twisting and turning and the fact that so much of the narrative arises as a result of eavesdropping and intrigue keeps you guessing as to what is real. In fact, a quote from the novel sums up this uncertainty brilliantly: “Life’s a game and everyone is cheating.” It’s a largely enjoyable read which has inspired me to learn more about this fascinating period of Russia’s history. With thanks to publisher for providing a review copy. No Comments on "The Winter Palace"